Denton County Sheriff’s deputies seized 76 malnourished Arabian horses from Renazans equestrian farm in the 8300 block of Hub Clark Road near Pilot Point this morning. 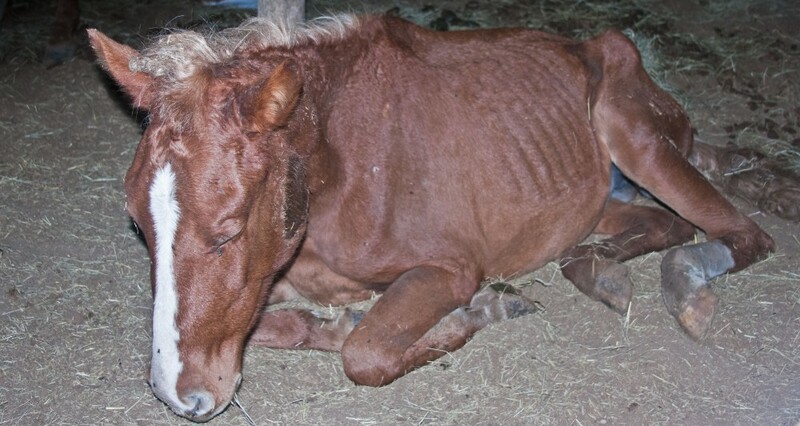 The horses were extremely emaciated with their ribs and large joints prominently displayed. No apparent food or water was available for the horses. The stalls for the horses being housed in the barns had not been cleaned in quite some time and some of the horses were standing in 6 to 8 inches of urine and feces. The Sheriff’s Office learned of the horses’ plight through a voice mail that was left by a caller on Wednesday. An animal control deputy investigated the location given by the caller the next day and then obtained an arrest and seizure warrant against the owner of the property, Gordon Dennis Key, on charges of Cruelty to a Livestock Animal, a Class A misdemeanor punishable by up to a year and jail and/or a fine not to exceed $4,000. The deputy then made arrangements with the Humane Society of North Texas to seize and transport the animals the next day. On Friday morning sheriff’s deputies converged on the farm with trailers and seized the horses with the help of volunteers recruited by the Humane Society from Passion Horse and Habitat for Horses. The horses are being taken to the Pilot Point Sale Barn and a horse ranch in Argyle, where they will be evaluated and treated by a veterinarian. The horses will be held at those locations until a custody hearing, which has been set for 10:30 a.m. on August 26. Please see the attached affidavit. This entry was posted in Horse Seizures on August 18, 2009 by Staff.